Okay, look, I have been a Denver Broncos fan all my life. Who knows how it really started? A couple buddies and I have decided it must be related to our birth month (and possibly our sign. Yes, our Zodiac sign…). My birthdate is September 18th 1987, in Brantford, Ont. At the very same time that my Mom was in labor, so was Nick Fitzgerald’s mother. We popped out on the same day, probably on the same floor of the hospital. Also likely on the same floor was Mrs. Hewson. She was giving birth to a boy as well, Kyle. Two days later, he was born. Unbeknownst to one another, although I’ve known Nick since novice hockey when we were ten, we all emerged as Broncos fans. I met Kyle years later through a friend. I learned that we all are huge fans of Denver before we knew about our birthdays (and some people say Facebook is a waste… tssk. Facebook was the tool that allowed this paramount discovery to be made possible). We all remember the Super Bowl years, but we were pretty young… and it was a long time ago. Ever since John Elway, Terrell Davis, Rod Smith, Shannon Sharpe, and Ed McCaffrey ran the offense while Al Wilson, Ian Gold, and Trevor Pryce solidified the D, the team has been living in the shadow. Specifically Elway’s, who some, including Pardon the Interruption host Michael Wilbon, say is the league’s best quarterback ever. Our QB situation actually hasn’t been terrible… even Brian Griese made the playoffs; Jake Plummer dominated the bootleg while leading the team to two 10-6 records, earning multiple playoff berths; Jay Cutler was the next big thing, until he decided he was bigger than the team and cried his way into engineering a trade to his hometown; and finally, Kyle Orton once led the team to an 6-0 start. Griese lost his one playoff game in 2000. Plummer had to go on the road to Indianapolis twice, both of which were underwhelming losses to Peyton Manning. Then Jake the Snake found a way around the Colts in 2005 by instead facing Tom Brady and the Patriots who had won the previous two Super Bowls. We thought the stars were aligning for our Broncos, but the Pittsburgh Steelers thought otherwise and showed us that defense wins championships. We were so close! That summer the Broncos surprised many football enthusiasts by drafting Cutler out of Vanderbilt, who was tagged as the heir apparent to Elway. The writing was on the wall for Plummer, acting as a “lameduck” quarterback. But he still managed to lead the team to 7-2. But when the team lost two straight, fans urged for Cutler. Despite still being a stellar 7-4, the organization, probably inexplicably, handed the reigns over to Cutler. Cutler couldn’t grow enough on the go, and Denver missed the playoffs. Cutler showed flashes of brilliance and what everybody wanted him to be. However he also showed more than flashes of erratic play, and couldn’t break the seal of Elway’s shadow. When he couldn’t do it after just one full season, he bought his plane ticket out of Denver in exchange for Kyle Orton. After bursting out of the gate like bats out of hell in 2009 winning six straight, Orton and the crew devastated fans by losing eight of their next ten games to miss the playoffs in a collapse worse than the Toronto Maple Leafs, if you combine all their playoff collapses since 2004. These quarterbacks couldn’t finish like Elway, and while they showed potential of being on the cusp of greatness, they were always a step behind… and lacked his consistency. They just didn’t quite have it. After a 1-4 start to 2011, Orton fizzled out, leading to the unorthodox rookie Tim Tebow replacing him. In his first outing, with three minutes left, down 15–0, Tebow miraculously led the Broncos all the way back to an 18-15 victory! This was the start of something truly special. It was called “Tebow Time” and it was absolutely spellbinding. Bolstered by a stellar defense, the golden boot of Matt Prater– who kicked field goals routinely of 60 yards– and Tebow himself, even with his imperfect throwing release and exciting scrambles, it didn’t matter how many points they were down, they always found a way to comeback and win at the end. The infamous run included four like-consecutive game-winning drives in the fourth quarter or overtime in Weeks 11 through 14, clinching a playoff berth and division title. This was clearly the most amazing run us three Bronco boys ever witnessed. Hell, for any logical human being, much less football fan, this was truly spectacular and still had to be the most amazing run witnessed. Ever… much less just us Bronco fans. In the playoffs, everybody was sure Tebow Time would end. Denver matched up against the big-boy Pittsburgh Steelers. Cruising to an early lead, us die-hard Bronco fans were very pleased, but still not comfortable with the cushion our team had assembled. By the fourth quarter, it looked like the same old story to unveil for our beloved Broncos as the Steelers chomped back to tie the game to somehow send it to overtime. Denver won the coin toss, which was worthy of some optimism, even though Pittsburgh had all the momentum. To cap the magic of this season, how about an NFL overtime record? Play-action fake to the running back, Willis McGahee, and Tebow rolled. He would throw, again. By the end, the quarterback who everybody said couldn’t throw had lit up the league’s top defense for 316 yards! Who can’t throw the ball? Ben Roethlisberger didn’t throw for as many yards… just sayin. Anyway, Tebow threw it long to Demariyus Thomas cutting across the middle. The Steelers defenders, playing the run, had just single-coverage on Thomas with little help. Thomas had a step on Pro Bowl safety Troy Polamalu, and the throw? It was PERFECT. In stride, Thomas caught the pass and threw a wicked stiff arm to Polamalu before galloping to the endzone. That was it. 11 seconds. One play. 80 yards. Six points. The win. Magic. In the most unlikely way possible, the once upon a time 1-4 Denver Broncos stormed back and not only made the playoffs, but won a playoff game in fashion too unbelievable for Hollywood. Despite winning the Super Bowl in years past, for us three Virgos born in Brantford General in a two-day period, this was pure football bliss. This was our Super Bowl. Tim Tebow could do nothing wrong, and his magic was nothing less than legendary. Tim Tebow has it. Amidst a sea of neck injuries, Peyton Manning’s Colts were a lock for the first overall draft pick. The much-hyped Andrew Luck, a quarterback himself was available and the Colts snatched him up. Rumours circulated, but how could Denver, the franchise captivated by this surreal playoff run be interested in Manning, whose neck seems about as brittle as an eggshell? Especially when all Tebow did was win, win, win. Then, it happened. 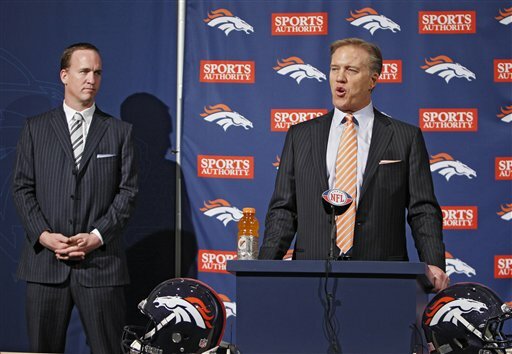 On March 20th, 2012, John Elway signed Peyton Manning to a 5-year contract for $96 million with the Broncos. Consequently, Denver traded Tebow to the New York Jets for guess what? Two late-round draft picks. What happened to loyalty? I remember, this is a business, and clearly Elway wanted a traditional quarterback, such as he was… and didn’t much care for the sometimes erratic Tebow, despite his win-loss record. Peyton too, has it, unquestionably. His it is more conventional and surer than Tebow’s it. But come on! What happens when our new, prized, free agent QB has his eggshell broken? Then his it doesn’t matter. So, who does Denver have suiting up behind Manning? Not Tebow. Not even Brady Quinn, who backed up Orton and Tebow, but Caleb Huene. That’s right… who? It would appear that Manning was unwilling to open up and teach the young Tebow the right way, in what appears somewhat like Brett Favre passing the torch to Aaron Rodgers. That conversion to the younger quarterback only resulted thus far in a Super Bowl, the ultimate goal. Although Manning is inarguably toward the twilight of his career, he appeared to be too selfish to take this phenom under his wing, or maybe it was Elway who didn’t want his big-money star to be distracted with teaching someone for the future. With speculation of Manning being “one hit away” rampant, a Plan B appears like a good thing to have. 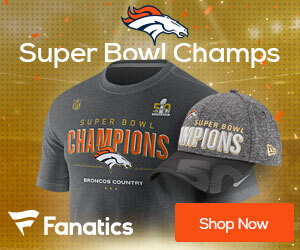 Alas, the Broncos don’t have one, and us three Denver fans, and probably a plethora more, will have to go the foreseeable future with all our eggs in one basket. And for what? A fourth and a sixth round draft pick? Eek John. Really? For two weak draft picks, we could’ve kept our boy-wonder who somehow guided our team from 1-4 to the playoffs (insert Herman Edwards clip here). And with any luck– any actual effort– the future Hall of Famer could have groomed our hero into a legitimate quarterback. We already know Tebow’s a winner, who can turn nightmares into dreams… so why couldn’t we have held onto him as a backup plan? Now, we have to hope all our eggs don’t crumble like an eggshell… because a Plan B just doesn’t exist. Nothing short of beautiful writing from a fellow die-hard Broncos fan. Detailed and accurate account of the direction our team has gone during the past decade and half, including all the horrifying lows and unbelievable highs. To think, at one point in time the Broncos (and the AFC West as a whole) were looked at as the weakest team/division in football and in short time are now being called superbowl contenders. Funny how signing a future HOF quarterback can do that, right? However, do not mistake that previous statement as a shot at the one and only Timothy Tebow. I didn’t want to get into the whole “Tebow-Time” talk, but in a blog written by a friend of mine who actually understands the impact Tebow had on our organization, rather than joining in on the hate-wagon, I have to. Coming from a person who watched almost all of his games as a Gator in his final season at Florida and of course all his games as a Bronco, there is truly only one word that can describe him….Winner. Win at all costs. Wear your heart on your sleeve and never quit. Some say his accuracy is awful, his throwing motion doesn’t suit the NFL and he will never be a starter again in his career. I, for one, completely disagree and think the Broncos made a horrible mistake trading him when they brought in Peyton. What better mentor is there, both for the physical attributes and mental capacity for the game,than Peyton Manning? Who knows what may have happened if when Peyton retires we had a rejuvenated Tebow leading the Broncos in the prime of his career. What Tebow can do for the Broncos, he WILL do for the Jets!! First this is a great article, although I disagree with one comment. The beginning you said being a broncos fan had to have come from birth date.. I’m born 8 days before you and I was not bitten by the broncos bug, but instead the Bears bug. But one thing us Bears and Broncos fans have in common is we bleed blue and orange. Do we leave that to our birth month? But I think Manning could lead the Broncos into new territory and help this team. Good stuff…..don’t know if I agree with the Tebow mania but the team he led at the end of last year did manage to win some games so I’ll roll with it for a while. I’d still would have liked to have seen how well Tim would have done facing any team for the second time. Lots of QB’s seem to do well on a first run through only to get stunned the second time through. The idea that Peyton wouldn’t ‘tutor’ Tebow is something I’d like to see more substantial support for although going back to Indy, it sure doesn’t look like anyone was prepared to take over so maybe so……not a fan of ‘conspiricy’ theories myself. Of course, if I had the choice, I’d take Peyton any day over Mr. Tebow regardless of his age. Peyton has shown time and time again his ability to lift a team up on his shoulders…..as Tebow did last year (if only for a far far shorter timespan) with the big difference being that Peyton’s offence scores points…..while Tebow’s offence usually takes time off the clock without much to show for it. What saved Denver at the end of last year was a defence that shut down opponnents while they waited for the offence to get some sort of scoring together. Denver has shown, especially in the last little while, that it doesn’t always have to play ‘keep away’ just to stay in a game. …..and the whole birthday thing…….made me laugh… a lot….then I realized that my brother, who has been a die-hard Broncos fan since early grade school was born September 22!!! I always assumed it was a combination of the colour orange and the fact that the Bronco’s were really something back in mid-late 70’s when he was growing up. His favourite colour on the bandwagon so-to-speak. Now I might have to re-think that whole idea……..I wonder how many Bills fans were born in August?? I only watch a few NFL games throughout the season, but I was really surprised that the Broncos would give up on Tebow after the amazing job he did at the end of last season. He may have been a flash in the pan, hard to say since he did not get another opportunity to take to the field for the Broncos this year. One thing, which I find fascinating, is the way the Jets have been using him and Sanchez on the field at the same time. Seems so weird to have 2 QBs on the field at the same time and they put them in the patterns – especially Tebow as a running back. Denver is obviously trying to “buy their way back into contention”, just like the Yankees do every year. I actually love it when the Yankees get their asses kicked in the playoffs – don’t you? I think Denver’s short term thinking is nothing short of stupid, putting all their “eggs” in Mannings’ basket. He’s good, as you mentioned, but he’s older, frailer and there is no back up plan. Do you think the Denver team watches ever play and ever sack with their fingers crossed? Thanks for the insight Jesse. Kris Sept. 22 eh? Wow, now that’s ironic! Brian, I know I flinch every time Manning gets hit. I bet they do too!! Dave, doesn’t look like it…. Check out my newest contribution after last Monday night’s crazy ending!! I don’t like fools-ball. End the NHL lockout! Jesse…I agreed with everything you said. It looked as though the Broncos had another winning quarterback in Tebow. In typical fashon, the Broncos field another amazing upstart QB. The it appeared that they ‘sold the farm’ when they traded Tebow to the Jets and picked up a damaged Peyton Manning. It left everyone scratching their head. It left Bronco fans spinning into deep depression. Well, it seems the Denver brain-trusts knew exactly what they were doing. Peyton ‘the machine’ Manning looks as though he is taking the Broncos to another Superbowl. So, next February, long after all the number 15 jersey burning is done, number 18 will be holding up the Lombardi trophy, and all Broncos fans are going to be saying the same thing… “Tim who?? ?” I hate Manning, and I hate the Broncos, cuz I’m a Chiefs fan, but I admit I kinda like the irony of the situation, and the totally unforseen ending that no one saw coming. Proud of you Jess! I liked your history of players that have been on the teams. Relevant statistics. Keep it up bud! It looks like the magic is back in Bronco country. As a fellow blue and orange die hard, it’s hard to believe somebody can be better than John Elway, but Peyton is sure looking good so far. Let’s hope the momentum continues, and we are once again Super Bowl Champs.